What Do You Want to Know About the 2019 Kia Niro EV? The 2019 Kia Niro EV is the production version of the electric concept crossover that debuted back at last year’s CES. We’ve already driven the hybrid one, and now we’re going to putter around in the fully-electric one. So tell us what you want to know! Our own Jason Torchinsky considers it a wagon, not a crossover. Here’s why. Range of 239 miles on a single charge. A 64 kWh battery pack paired with a single 201 horsepower electric motor with 291 lb-ft of torque. Charge rate of 100 miles in 30 minutes, or 80 percent capacity in 75 minutes (around 190 miles) while DC fast-charging. A level 2, 240-volt, 7.2 kWh charger takes just under ten hours to fully charge the battery. Bespoke 17-inch “Aero” wheels and special blue interior accents. Standard stuff includes that 7-inch touchscreen with Apple CarPlay and Android Auto, a wireless phone charging cubby, forward collision warning and avoidance assist, lane departure warning and lane-keep assist, blind spot and driver attention warnings, smart cruise control and rear cross-traffic collision warning. 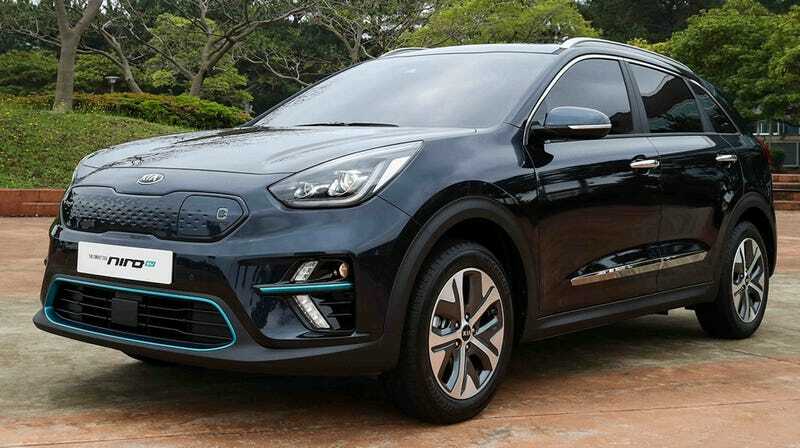 Other than that, the Niro EV will be available in EX or EX Premium trims, the latter of which gets an 8-inch touchscreen over the standard 7-inch, LED headlights, 8-speaker Harman/Kardon audio, heated steering wheel, mood lighting, park distance warning, and a fancy thing Kia calls the deluxe scuff plate. Every Niro EV also comes with a suite of EV-interface stuff to help you control the conditions of the car and the battery, like charging status, scheduled charging, temperature pre-conditioning, and a capability that lets you send waypoints and points of interest to the car’s navigation system. I think that last one is probably so you can route yourself along a path of DC fast-charge stations. So anyway, I’ll be doing a list of mysterious “fun” activities in San Jose, California in this thing, but please let me know what you’d like to know about it and I’ll do my best to answer.